Experience: 2 Years Experience of practice at Bar/Judicial service or as Law Officer in the Legal Dept.of a reputed commercial Bank. Qualification, Experience: An Officer with 05 years commissioned service in the Army/Navy/Air Force or a Police Officer not below the rank of ASP/DSP with 05 years of service or Officers of identical rank in Para Military Forces with 05 years service. Territorial Army Officers should have minimum 05 years of embodied service. Qualification: B-Tech /BE Degree in Electrical Engineering with minimum 50% aggregate marks (for SC/ST/OBC /PWD min 45%). Age Limit: Candidates age limit should be between 21 - 35 years for Post No. 01 and 21 - 30 years for Post No. 02, 03 & 04 as on 01-01-2017. Age relaxation is applicable to 05 years for SC/ ST candidates, 03 years for OBC candidates & 10 years for PWD Candidates. For more relaxation details refer the notification. Educational Qualification: Candidates should possess Bachelor Degree in Law (LLB) for Post No. 01, Qualified Chartered Accountant for Post No. 02, B-Tech/ BE Degree in Civil/ Electrical Engineering with minimum 50% aggregate marks (Minimum 45% marks for SC/ST/OBC/PWD) for Post No. 03 & 04 . Candidates should pay Rs. 100/- (Intimation Charges) for SC/ ST/ PWD Candidates and Rs. 600/- (Intimation Charges + Application Fee) for all others including OBC candidates through online by using only Master/ Visa Debit or Credit cards or Internet Banking. 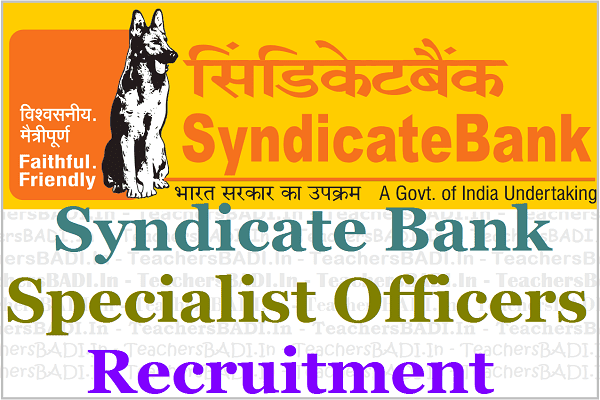 Eligible candidates may apply online through the website www.syndicatebank.in from 01-03-2017 to 14-03-2017. For more details like salary, experience, reservation & other information visit the web portal.